Click on one of the articles below to view it larger. Mick, a very well known Martial Artist, has been in the industry for over 30 years. Mick was a champion competitor and has gone on to train many champions through his Double Dragon gym. Sifu Chan Cheuk Fai is one of Australia’s most highly regarded and respected martial artists. Sifu Chan runs the Jin Wu Koon Academy and has been working with Istvan since the early 90’s. "Istvan is a boxing instructor of great passion and unique skill. I first saw him teach in 1991 and I was impressed by his method of teaching.The technique he uses sets him apart from many other boxing trainers I had previously seen. His technique is much more like a martial art, especially his punches and blocks, creating a very tight style. His fighting strategies and tidy technique is also displayed in his students and fighters. With more than 20 years teaching boxing, it is reassuring that Istvan's passion for the sport and his ability to pass this onto others is still there." Arthur Tunstall is the Honorary Secretary Of Boxing NSW. For over 50 years Arthur Tunstall has committed his life to sport in the administration field. "I have known Istvan for the past 20 years through his involvement in the sport of Amateur Boxing. He has been a Hungarian Junior Champion and also has won the International Pupils Championships in Szolnok Hungary. He is now a well respected State Coach who has been selected to train a number of NSW Teams competing in the Australian National Championships. He currently runs The Euro School of Boxing in Daceyville, where he teaches the Noble Art of Boxing. My personal congratulations go to Istvan for his life's support to the promotion of Amateur Boxing. " Dr Lewis, is well known in the boxing community as a reliable and experienced ringside physician. Dr Lewis has been involved in amateur and professional boxing for countless years, and has associated with Istvan Solyom since he first started coaching in 1988. Dr. Lewis often recommends Istvan to people, as he has seen his ability and experience over the last 20 or so years. 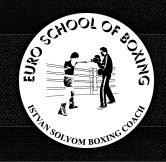 © 2016 Euro School of Boxing. All rights reserved.